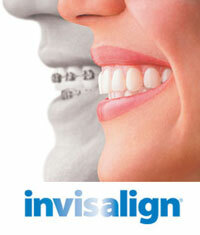 Invisalign is the nearly invisible way to straighten your teeth. Invisalign’s clear aligners are virtually invisible–that means you can always feel confident showing your smile, even while you’re wearing your aligners to straighten your teeth. Just as important, you can eat all your favorite foods and brush and floss without the problems associated with traditional orthodontic treatments. Getting your teeth straightened isn’t just for teenagers anymore. Many adults who have felt uncomfortable with their smiles now have straight, healthy teeth. You can, too! If you weren’t able to get your teeth straightened when you were younger, now is the time to find out more about Invisalign–the clear alternative to metal braces and wires. Even if you did straighten your teeth when you were younger, your teeth may have relapsed over time. Invisalign can be a great way to correct this very common problem among adults. Besides achieving the beautiful straight smile you’ve always wanted, there are many health benefits to straightening your teeth. Teeth that are not aligned properly in your mouth create what dentists call “malocclusion.” Left untreated, malocclusion can lead to periodontal disease and create abnormal amounts of stress on teeth and jaws, which leads to premature wear. Properly aligned teeth are easier to brush and floss than crowded or crooked teeth. With good oral hygiene, the chances of having plaque retention, tooth decay and periodontal disease can be reduced. Properly aligned teeth also reduce the risk of expensive procedures required to repair the effects of abnormal force, such as tooth chipping, breaking, or wear; and can be less stressful on the supporting jaw bone and joints. Straightening your teeth can make a significant difference to having a healthy mouth and keeping your teeth for life. We can’t tell you exactly how long your treatment will take. But, on average, Invisalign treatment takes about one year or less. You will visit our office every month or two to check your progress and get a new set of aligners. The cost of treatment is similar in cost to traditional braces. In addition, if you have orthodontic coverage, Invisalign is often covered to the same extent as traditional braces. Dr. Farr also offers a variety of affordable payment plans. Our office will be happy to work with you on all of the insurance and financial details.